This case is very interesting. It involves the use of cannabis oil in suppressing a cancer that has no effective conventional treatment outside of surgery. It is even more captivating because he was using a cannabis oil preparation that was mostly/all CBD which is not the usual way we have seen people treating cancers. Lastly, it’s thought-provoking because this is the first time that we’ve witnessed cancer respond to pure CBD oil as opposed to using a balanced THC/CBD preparation. It also highlights the absurdity of the Iowa criminal justice system, and how a man can be made into a criminal based only on his will to live. Benton Mackenzie age 48, a resident of Iowa, became a lightning rod for marijuana activists last year after he was arrested for growing his own medical marijuana in a state where possession of pot is still highly illegal. In fact, Iowa and Nebraska have gone so far as to sue Colorado for increasing drug trafficking through their states. Mackenzie claims that he was growing and using pot for treating a highly painful and deadly cancer. At the time he was facing the possibility of an extended prison sentence if found guilty—a prospect that would insure his death as certain as if her were executed by the state. That prospect came about anyway after he was deprived of his life-saving oil. May, 2013. In Davenport, Ia., Scott County jurors delivered a guilty verdict on four felony charges. His wife and son were also convicted of the same offences. Benton’s case made national news because his marijuana use was to control the growth of several large, painful tumors on his buttock and legs. Without the use of this controversial and illegal substance, his tumors would grow like desert flowers after a rain shower. He was not growing pot for any other reason than for self-use. However, that’s where the problems started since all forms of pot are still illegal in Iowa. It also demonstrates how a judge with a different agenda can sway a jury by mandating that he not testify to the real reasons why he was using cannabis oil. Because Iowa law does not allow use of marijuana to treat Mackenzie’s condition, Judge Henry Latham barred defense attorneys from saying he used marijuana out of medical necessity. That ruling further infuriated many Iowans who have reached out to support Mackenzie since his arrest. A “Free Benton Mackenzie” Facebook page had 1,797 “likes” on Wednesday afternoon. Mackenzie believes the judge’s ruling sealed his fate with jurors who might have been more sympathetic had they learned about his condition. Based on the fury of some Iowans, I’d say that many agree with Benton, that he was made an example of. To make matters worse McKenzie had a prior record of drug use and arrest. He had two prior felony convictions. This means that based on Iowa law he could be labelled a habitual offender. If the charges stick, habitual offenders receive a minimum mandatory prison sentence of three years. The prior convictions however may have had medical applications. Mackenzie and his wife Loretta, had previously been prosecuted for growing marijuana which he claims was used for medical treatment. Back in 2011, they both pleaded guilty in Scott County to drug charges and were put on probation. Benton Mackenzie also had another unknown drug conviction in 2000. The problem that lead directly to his death started during the legal proceedings. Because of this Mackenzie was not able to get back to Oregon for treatment until September of 2014. That was the last time he was well enough and able to travel to Oregon for treatment. It’s unclear exactly how long Benton had to abstain from his cannabis oil. Based on the quotation provided later in only six short weeks wiothout cannabis oil his tumors rapidly returned in a most frightful and aggressive way. It’s equally impressive that for two years this man was able to keep this novel and deadly cancer at bay using only pot oil. They were found guilty and sentenced to probation. Mackenzie’s ordeal reminds Iowans that much work needs to be done to amend these draconian laws. Iowa is truly a backwater state. An attempt was made by state senator Joe Bolkcom, D-Iowa City. It’s more than that however, Benton was using cannabis to stay alive. Right now half of the states in the US allow for some use of medical marijuana while three states and the District of Columbia, allow for recreations use as well as medical. The only exception for Iowans is the use of cannabis in treating seizure disorders due to a recent narrowly passed bill in 2015. An angiosarcoma (AS) is an uncommon malignant neoplasm characterized by rapidly proliferating [growing], extensively infiltrating…cells derived from blood vessels and lining irregular blood-filled spaces. Specialists apply the term angiosarcoma to a wide range of malignant endothelial [inner lining of blood vessels] vascular neoplasms that affect a variety of sites. Angiosarcomas are aggressive and tend to recur locally, spread widely, and have a high rate of lymph node and systemic metastases. The rate of tumor-related death is high. Angiosarcomas arising at different sites and in different organs have some distinct features. Angiosarcomas may occur in any region of the body but are more frequent in skin and soft tissue. Angiosarcomas also can originate in the liver, breast, spleen, bone, or heart. 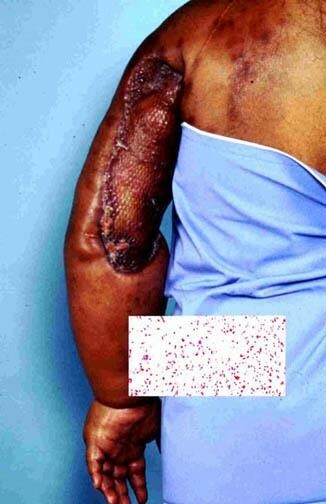 All angiosarcomas tend to be aggressive and are often multicentric. These tumors have a high local recurrence rate and metastasis because of their intrinsic biologic properties and because they are often misdiagnosed, leading to a poor prognosis and a high mortality rate. Malignant vascular tumors are clinically aggressive, difficult to treat, and have a reported 5-year survival rate around 20%. Advanced stage at presentation and lack of extensive excision are associated with higher recurrence, higher distant metastasis rates, and worsened survival. Multiple randomized studies using…chemotherapy fail to show a survival benefit from neoadjuvant chemotherapy,…but no survival advantage. Because of the poor results…and the significant toxicity, specialists reserve…chemotherapy for patients with high-grade lesions. 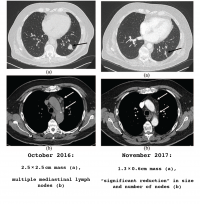 The regimen is continued in those patients who respond with tumor shrinkage after two to three courses of multiagent chemotherapy after tumor resection. However, consider that 50% of angiosarcomas have distant metastases, and irradiation does not improve survival. Recurrent neoplasms typically (80% of cases) develop within 2 years of the resection. Thus, the follow-up should be extremely stringent, ie, every 3 months in the first 2 years. A chest radiograph every 6 months during this period is mandatory. If the chest radiograph reveals a suspicious nodule, obtain a CT scan of the chest for confirmation. MRI is the most accurate technique for detecting locally recurrent or residual sarcoma. The baseline postoperative MRI examination serves a vital role in the evaluation. After the first 2 years, schedule visits every 6 months for the next 3 years. After 5 years, see patients annually. As you can see from the above description this cancer does not respond well to either chemotherapy or radiotherapy. That means there is nothing much an oncologist can do for these patients outside of surgically removing the tumor and crossing your fingers. Of course, that’s where cannabis preparations might be able to help out. If you or I were in a similar situation I’m certain that we would ignore the law in order to stay alive. That’s the choice that Benton Mackenzie had to face. He chose to treat himself with cannabis oil, and by preparing freshly juiced marijuana plants, instead of seeking marginally effective chemotherapy. Mackenzie and his wife, Loretta, and the couple’s grown son, traveled to Oregon last year to obtain medical marijuana. Mackenzie was an Oregon medical marijuana patient—the state allows residents from out of state to obtain medical marijuana patient cards. Mackenzie said he worried that a traditional chemotherapy treatment would damage his heart. Here’s where it gets very interesting because Benton was using a special cannabis preparation. The tumor, which was the size of a golf ball, nearly vanished within two months after he began treating it with cannabis oil. Mackenzie has continued treatment using oil that he gets in Oregon since his June 2013 arrest. After that he followed up with his own home-grown versions to save money. For unknown reasons Benton tells us the oil was available only sporadically especially when he was arrested. Because of this interruption in therapy, the tumor started growing very quickly. Eventually it grew to the size of a grapefruit. From www.medicalcannabisreport.com, we see a description of the exact medication used. He used high-CBD strains of cannabis, which he grew himself, to treat his condition — some of which, like Valentine X, provide a 25:1 CBD-to-THC ratio. For two years, Mackenzie was able to hold his angiosarcoma at Stage 1 though the use of high-CBD cannabis. After being busted for cultivation and incarcerated, where he was obviously deprived of his cannabis medicine, Mackenzie’s cancer progressed from Stage 1 to Stage 4 in only six weeks, resulting in his death. Although highly anecdotal, this case is convincing evidence for the power of the CBD cannabinoid to prevent tumor growth and possibly kill cancer cells. What I find particularly interesting is that Mackenzie was using what amounts to CBD rich oil which is available online from dozens of commercial outfits. Consider also the fact that this unresponsive, aggressive and deadly cancer was kept from advancing if not put into remission from simply using CBD! I would have to agree with the above quote that this story is highly anecdotal. 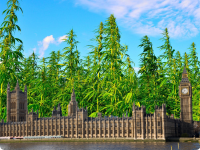 However, if this story is factual we, once again, see an extraordinary response to CBD. This is stunning in its applications. He reported that it significantly reduced his tumor size. It was the only one of his treatments that really helped him. It takes many plants to make the oil using this particular method. But law enforcement wrongly assumed the 71 plants would be used for distribution. Notice how quickly Benton’s cancer returned after the cannabis preparation was discontinued. Here we have a shocking description of how these cancers behave without cannabis, and with it. To me this isn’t just astonishing its near miraculous how CBD was able to prevent growth and metastasis of this destructive tumor. It’s all the more promising since there is no effective treatment for this disease. Prosecutors in Iowa were described by the Mackenzie family as particularly cold hearted and cruel. That’s because they knew that the only thing keeping Benton alive was the high CBD cannabis preparation he was using daily. The Mackenzie trial went viral and made national news. What people were astonished at was the fact that the judge did not permit him to tell the jury that he had cancer, or that the 71 plants were to be used to make oil which requires huge quantities of marijuana to make a tiny amount of the powerful oil. He then used this to treat the large, painful growths on his body. Benton and Loretta were given leniency and sentenced to three years’ probation. The leniency was too little too late. As a result of all the legal wrangling, Mackenzie was not able to get back to Oregon for treatment until September of 2014. That was the last time he was well enough and able to travel to Oregon for treatment. When incarcerated he was deprived of cannabis but upon release he might have been able to secure CBD online and his death might have been avoided. It’s hard to say for sure. There are still many unanswered questions regarding this case. Such as the dosing of the cannabis preparations. How much juicing was he doing? What was the role of the other cannabinoids both fresh and rendered into oil? This may be the first case where a tumor was slowed down or put into remission using only CBD oil. The Oregonian/Oregonlive did a piece on Mackenzie’s visit to Oregon last summer when he wanted to come to the state to obtain marijuana products that would ease cancer symptoms. At the time, he talked about moving to Oregon someday. He said he wants to live long enough to see through the appeal of his conviction. But he was frank about his condition and, though fervent about marijuana’s curative properties, he was realistic about his future. Benton Mackenzie lost his battle against angiosarcoma cancer Monday, and reportedly passed in his home surrounded by family. Mackenzie’s advocacy for medical marijuana patient rights in Iowa influenced the state to approve an unworkable cannabidiol (CBD) oil law that is now being scrutinized because it has yet to help a single patient gain access to medicine. Perhaps the state will be more open to allowing whole plant medical marijuana therapy options in the near future. Dr. Charles Goldman, a surgical oncologist at Mercy Medical Center in Des Moines, laments that Mackenzie’s self-treatment ended with prosecution instead of scientific research. Although Mackenzie’s claims that cannabis successfully reduced his tumor have not been scientifically verified, other research indicates that it’s reasonable the marijuana helped, he said.